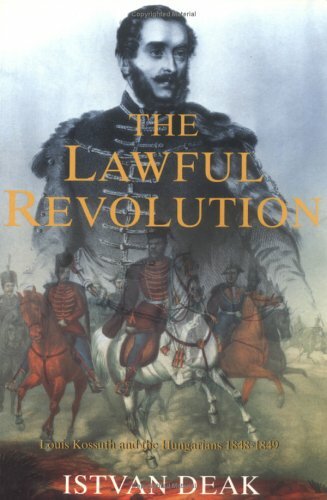 “The Lawful Revolution” is an excellent, detailed account of the Hungarian revolution of 1848-49. Even though it has Kossuth on it’s cover and in the subtitle (Louis Kossuth and the Hungarians 1848-1849), I guess that was only a marketing decision to capitalize on the familiarity with Kossuth in the USA, since this is no biography, it covers all events and relevant locations of the Revolution without regards if Kossuth was directly involved or not (though he was indeed with most of them). The revolution of 1848-49 was one of the most important moments in Hungarian history, and Kossuth is one of the greatest Hungarian heroes, but Deák (a Hungarian emigrant to USA) tries to be as objective as possible, I would say successfully. Though some biases can be seen, especially to the “nationalities” (mild underestimation of Slovaks, disregard of Serbs and sympathy with Romanians and regret that some cooperation between them and Hungarians was found too late). Deák’s main thesis of the “lawful revolution” is little bit too stretched. Regardless to all of this, I’d still say that this is an excellent book and I would recommend it to anyone interested in getting a broader picture of Hungarian revolution. I came to this book looking for answers to two broad topics: 1) details about extent and achievements of the social revolution and 2) Hungarian-Serb relations and if there was a possibility that the devastating conflict could have been avoided. Deák very nicely addresses the first topic, he cites the Hungarian census data (mostly peasants with comparatively large percent of small and middle nobles and practically non-existing bourgeois and workers), the structure of Hungarian decision making bodies (overwhelmingly consisting of nobles), and also many declarations that they issued as well as their personal correspondences and diaries. It is clear that the social revolution was very limited and that there was no force that would make the nobles give up more then they have. Nevertheless the author praises the achievements as admirable in the context of that time. The second topic is barely touched. I live in northern Serbia which was southern Hungary at the time, and I am familiar with Serbian historiography on the Hungarian revolution, and I was looking for broader and different angle perspective on Hungarian-Serbian conflict (civil war), but Deák dwells very little on that, which is ok I guess, since there were bigger issues in overall context. Or maybe this topic was out of the author’s focus and interest, because I found mistakes on more then one occasion (factual, not in interpretation, such as ranks, titles and positions of some people in the Serbian movement).